Modular laminate design with a 1-1/8" thick worksurface. The 3 mm impact-resistant PVC edges feature wood grain and tri-groove design details for an attractive finishing touch. U-Grouping with Modesty Panel. Ready to assemble. 71"W x 112"D x 29"H. Mahogany finish. 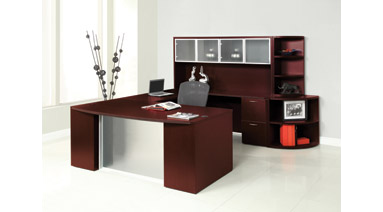 Includes bow top desk, glass modesty panel, faux pedestal desk with fixed box/box/file pedestal, bridge, credenza with file/file pedestal and hutch with glass doors.